My VMware VCAP5-DCA exam advice: lab it up! I passed the VCAP5-DCA back in May when it was in beta. I forgot how many questions are on the VCAP5-DCA but come to think of it, it doesn't really matter. What matters is your ability to perform administrative tasks quickly, and how quickly you can use Ctrl+F to find out how to perform administrative tasks from the VMware (the official VMware documentation is provided). With this exam, there is no way you’ll know how to do every task on the exam (unless you’re some sort of VMware robot from Palo Alto sent to destroy our dignity by scoring 100%). The good news is, you don’t need to know how to do everything, because the official VMware PDFs are made available! I passed the VCAP4-DCA and VCAP5-DCA. Check back next year for my VCAP6-DCA advice. Rote memorisation will help you pass the VCP5, design acumen will help you pass the VCAP5-DCD, but only practice will get you through the VCAP5-DCA. My advice for the VCAP5-DCA exam is to practice until you get sick of it. If you've been living in fluffy architect land drawing on whiteboards, you’ll definitely need to study before taking the exam. If you've spent the last weeks setting up a new vSphere environment from scratch or troubleshooting, you’re ready to go. Here’s an example task (I guarantee it’s not on any exam I did! ): Add the Cisco Nexus 1000V VIB to a VMware install bundle. Can you do it? If so, congratulations: stop reading this blog post and book the exam before you accidentally watch television and forget the knowledge. If you’re not sure how to add a VIB, find the VMware documentation PDF that explains how to do it. Do you understand the steps? Could you do it in under 6-8 minutes? If so, you’re probably ready. If it takes you 10-15 minutes, do a bit more practice: time is limited you’ll only be able to refer to the documentation 3-4 times before you start running out. Here are some suggestions to improve your administration skills. Lab it up! Your lab doesn’t need to be representative of the exam lab, just the features you’re unfamiliar with. Unfamiliar with storage? One ESXi host and Openfiler will do! Unfamiliar with virtual distributed switches? Sounds like you’ll need at least two ESX hosts. Watch the vBrownbags: if it has VCAP-DCA in the title, watch it! Sit the VMware official training: the Install, Configure, Manage along with Fast Track will cover everything you need in the exam. I prefer classroom training because you get to make friends in your local VMware community and share experiences. If you do the VMware courses, you'll get binders full of slides and exercises. BINDERS FULL. To be honest, I'd rather have the videos from TrainSignal handy. TrainSignal VMware vSphere 5 training: This is the cheaper alternative to the courses. If you have the will to self-study, this is good. If not, don’t bother. The relevant courses are VMware vSphere 5 Training and vSphere Advanced Networking Training. There’s over 24 hours of videos, but you should be able to study it all in a week. Skip over what you’re familiar with (you’re already a VCP: do you really need to watch a video on how to create a resource pool?) and cover your weak points. Read the blueprint with the mindset of the test writer: while reading it, ask yourself “If I was writing the exam, how would I test if somebody knew this?” about each point. If you were writing an exam question to test someone's competence with resource pools, how would you test it? Perhaps you'd create a resource pool hierarchy and VM reservations such that a VM wouldn't be able to power on. Then you'd ask the student to make a single change to the hierarchy that would allow it to power on. As with most technical training, you’ll start to forget knowledge as soon as you walk out of the training room and you'll lose the test mindset within a week. I suggest you book the exam no more than 3-5 days after finishing whatever study path you've set yourself. There's a lot of administrative tasks covered on the exam, and you won't have done them all before, but that's no reason for a professional like you (who has already achieved VCP5) to be scared. Today's blog post will be short like the sentences of a language I'm learning. ¿Comprendes? I'm not learning Spanish, I've just wanted to use one of those upside down question marks. Twenty years I've been waiting to use those question marks. I'll cover one chess piece, and one chess piece only! I'm assuming you've read Chess in C parts one and two. In part one, we covered the chess board and how to represent pieces. In part two, we covered how to model moves of pawns as well as a general approach to calculating whether a square is a potential destination for piece. Before we begin today, grab the code at the end of part two and compile it. 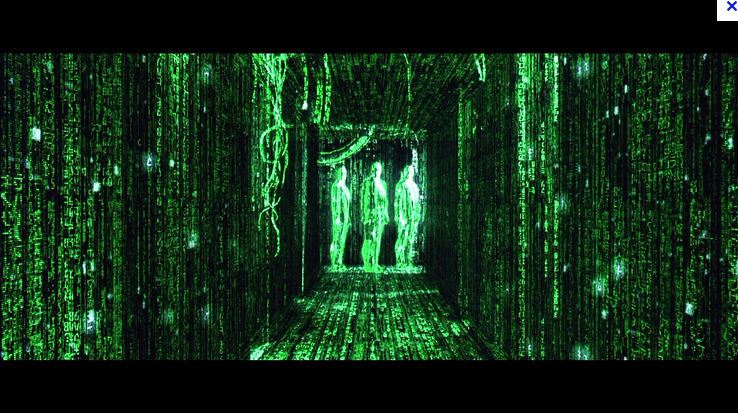 We're going to make some modifications to this code, and I'm assuming you're ready for some hacking. Today's piece is a rook. In chess, a rook is a piece that can move up, down, left or right any number of squares. Here's what a rook looks like. It's also the logo of about 642 financial services companies worldwide. And here are the potential moves of a rook. We're going to write code to calculate the potential moves. The rook is in (3, 4). Remember, we start counting at 0. And it's not a regular Cartesian plane. The castle represents the rook and the X represents the potential moves. The diagram assumes there aren't any obstructions in the way like other pieces or a banana peel. So, for any given square, how can we calculate whether there is it is a possible move for a rook? Here's the aid again. Each cell is represented by a pair of integers (X and Y). X represents row and Y represents column. The first square (0,0) is in the top-left corner. Don't get it confused with a Cartesian plane (the ones you probably learnt in math class) where (0,0) is in the bottom-left corner. every square on that row (row 3) is a possible move. every square in that column (column 4) is a possible move. Now, get some paper and write every potential move if the rook is in (3,4). Come on! It may seem obvious, but you need realise that something will be missing. STOP READING THIS BLOG POST AND ACTUALLY WRITE THEM DOWN! You done? Alright, you should have written down coordinates covered by the Xs. Let's check. I'm going to grab the code for iterating through the chess board from part one and modify it a little. You should understand this code and be able to write it without stressing. For the purposes of demonstration, I'm going to make two variables that contain the row and column of a rook. This isn't how you'd store the location of a rook: it's just a quick way of showing you how to detect a rook in the current row or column. This consists of two compound if statements within the nested for loop. 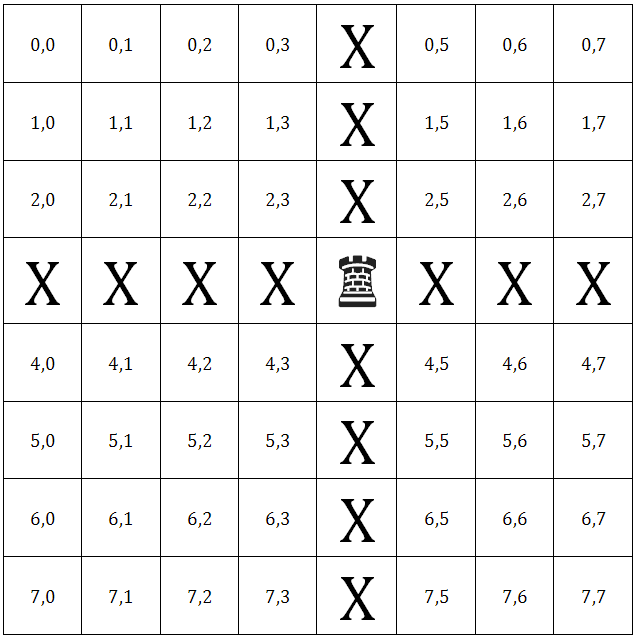 Whether the current row (iterated through by variable i) is equal to the row that contains the rook (pieceRow). 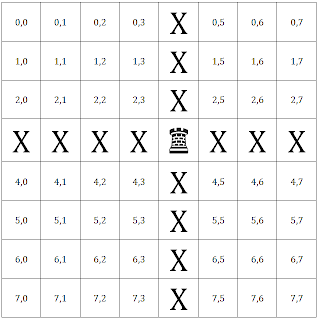 If this statement is true, then every square is marked as a potential move EXCEPT if the square is in the column containing the rook (pieceColumn). 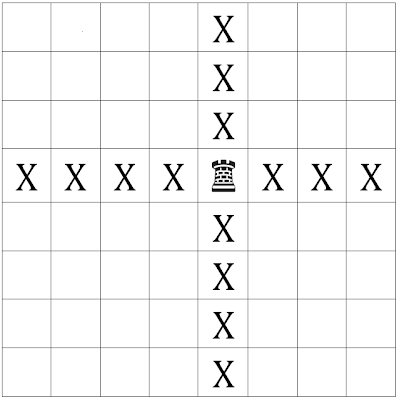 If it didn't check this, every square in the row would be a potential move (even the piece containing the rook!). We know this isn't true from our exercise above: the piece cannot move into its own square. 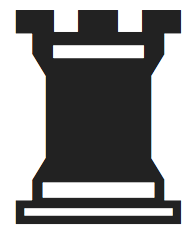 Whether the current column (iterated through by variable j) is equal to the column that contains the rook (pieceColumn). 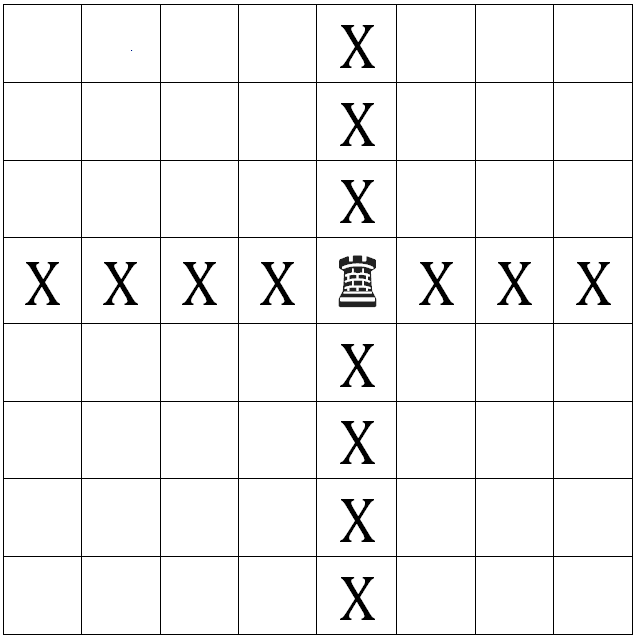 If this statement is true, then every square is marked as potential move EXCEPT if the square is in the row containing the rook (pieceRow). If it didn't check this, every square in the column would be a potential move (even the piece containing the rook!) We know this isn't true from our exercise above: the piece cannot move into its own square. If you're confused, the best way to understand is to write the code and see what happens, then break the code and see what happens. In fact, let's do this. Copy and paste this code. Now compile it. If all went to plan, your board should look like this. Let's test a few more possibilities! Replace the pieceRow and pieceColumn with 5 and 5. You should get this. You might also want to test some edge cases like (0,0) and (7,7) to make sure the algorithm works. Now, let's break this thing! If you haven't broken anything while coding, make sure you're actually coding because making mistakes is part of the process. Remember before how I said we had to make sure not mark the rook's current position as a possible move? We tested for that condition by putting a != pieceColumn and != rowColumn in the appropriate if statement. Let's remove that and see what happens! The rook no longer exists. It has been clobbered! I passed the VCAP5-DCD (that's an acronym for VMware Certified Advanced Professional - Data Center Design)! To be honest I didn't study and had no sleep, which makes it similar to my first year of college. At college, I even got the Dean's Commendation for High Achievement! The achievement was for my high marks, not for my sleeping. Anyway, I've never been worried about whether I would fail an exam. Like most college exams, the result was determined before I walked in. The exam just showed me the result. And that result was a PASS! Everyone's learning style is different, so what works for me may not be relevant to your style of learning. But my advice is, don't study for the exam. Instead, focus on becoming a better designer. The VCAP5-DCD tests your application of knowledge, and you won't learn that from memorizing the content on the exam blueprint. The blueprint isn't a list of topics to study, it's a list of skills and abilities you should have. Rote memorization will help you pass the VCP5, practicing administration tasks will help you pass the VCAP5-DCA, but only design ability will help you pass the DCD exam. You need to be able to ask why and understand why. Let me give you an example. Objective 3.5 states that you should be able to "Design a vApp catalog of appropriate VM offerings (e.g., templates, OVFs, vCO)." Anybody can open the vCenter client, make a new vApp, add some VMs and set the startup order. But have you developed an opinion on vApps? Do you understand their advantages, disadvantages and their limitations? Which limitations have stopped VMware from packaging their own applications as vApps? Would any of these limitations apply to an application your company is developing? What application would you most like to see as a vApp? What application can't you believe isn't already a vApp? Instead of learning about vApps, the more helpful skill to learn is to ask why something is the case. Pick any skill listed on the blueprint, say, storage design. You probably know what the different types of multi-pathing are. Why would you use one or the other? If there are Microsoft clusters in your environment, how does that affect which method of multi-pathing you use? If you can whiteboard a VMware design and explain the why behind every box and line you draw, you're probably ready. Try whiteboarding the following scenarios. A large customer wants a solution that has no single point of failure. That large customer just acquired the small customer. Design the migration strategy. Remove one of the lines between storage and compute. What is the implication of this? between the public cloud and private cloud is. How does it work? You don't even need to have experience whiteboarding in front of a client. Try whiteboarding in front of somebody who knows nothing about VMware, or even enterprise IT! I've found that some of the trickiest questions I've got have been from beginners. With most other IT exams, you can skip between questions. In the VCAP5-DCD, you can only go forward. There's no ability to flag questions and return to them later. Consider this a blessing: once you've answered the question, you're locked in! You'll only need to focus on the question at hand. Control the things you can control and don't worry about the rest. I can't recommend you anything that will help pass the exam, because I didn't revise or study for it. However, I can recommend some resources that can help you become a better designer. vBrownbags are free regular online meetings run by experienced VMware architects. If you want to know how experienced designers and architects think, watch some of these. The Feynmann technique involves pretending to teach the idea to a new student. This forces you to understand the concept which should make you a better designer (and consultant). Download the products and use them. Don't just do the usual VCP style labs: go off the rails! What happens to a VM when you power the destination host off during a VMotion? Do you understand what happened? If not, read up on VMotion! When should you stop reading? When you can explain it to someone who doesn't know anything about VMotion! Don't be afraid to go off-topic. Anyway, I thought that would be the last VMware exam for me, but VMware have just VCP-Cloud and VCAP-CID. Time to book some more exams. The certification treadmill never ends! 50% VMware VCP 5 exam voucher for Australia and New Zealand non-VCPs! If you're a VMware professional who has sat the VMware ICM (Install, Configure Manage) course but hasn't certified on VMware 5, why the heck not?! Now is the perfect time to certify! Get 50% off your exam by using the voucher code ANZH56VCP5. The exam usually costs $230.00. I'm no mathematician, but that's at least a $27.83 saving! Don't put it off for any longer: go to the Pearson VUE VMware login page and register for the exam. If you're certified for VMware 4, don't get certified for VMware 5 and get certified for VMware 6, you'll have also certified how lazy you were! I was asked today if I could write a C function that reversed a string without knowing the string size. What a boring question! I don't think they were particularly interested in whether I could reverse strings. I had told them I could write C, and I think they were trying to verify this by handing me some rope. Here's what I whiteboarded. Let's assume the string is HELLO BURGER!. Why hello burger? Because "Hello World!" is overdone and I like burgers. Burgers from Grill'd, to be specific. Grill'd is a faux-90's Australian hamburger chain aimed at Sydney hipsters with too much disposable money. To be clear, I'm not a hipster and I don't have much disposable income unless you count pocket lint as disposable income, I just like their burgers. I recommend the Zen Hen. I've placed an index grid above the phrase. 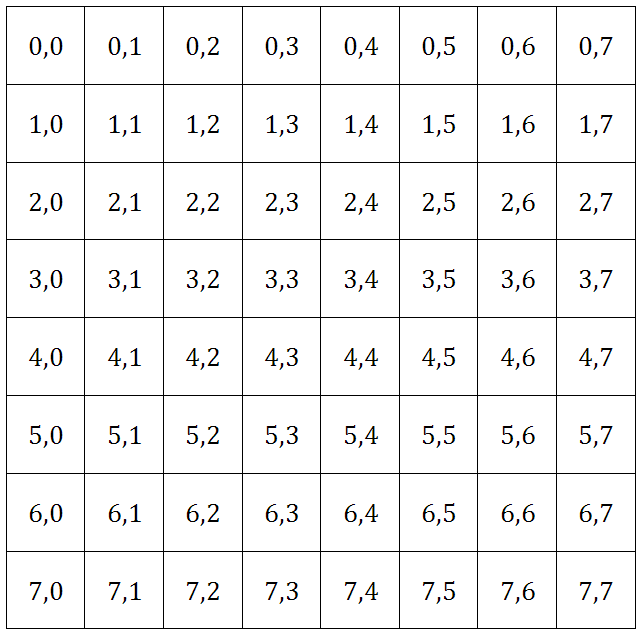 Keep in mind that in C, we start counting at 0. So even though there are 13 letters in "HELLO BURGER! ", the final character (an exclamation mark) is at index 12. If we were to print the string with the statement printf("%s", input)then "HELLO BURGER!" would appear. The statement printf("%c", input) would print "H" and printf("%c", input) would print "B". Pretty straight forward. 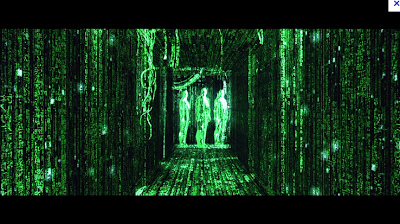 You might have noticed there's a \0 in the end: in C, this is a "end of string" terminator. In C, a string is defined as a...err..string of letters followed by a \0. The \0 tells C that the string has ended. If a string consists only of \0 then it's empty. This is an empty string. If input is \0, it's empty. The following is not a string. And because it's not a string, functions like strlen() that iterate until they see the terminator won't work. Let's go line by line through this application. 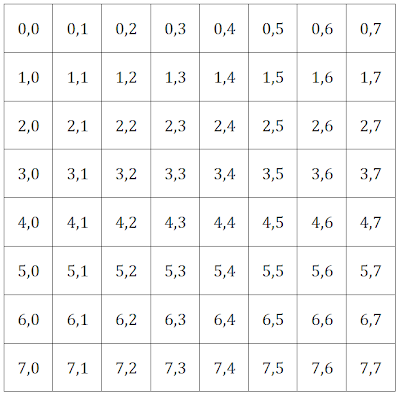 First of all, let's get the basics out of the way: include string.h along with your usual libraries: you'll need it to calculate the length of an input string. The reason why this is required will become obvious later. In our function signature, we'll be accepting string input. Since we're accepting a string, the type of the input will be a character pointer (char*). We'll also be returning a reversed string, which is why we return the same type. Remember, there's no string datatype in C, which is a reason why the language is unsuited for any quick and dirty string manipulation. To reverse a string in C, we'll be using a for loop. We'll need to iterate through each character in the string which will require us to know how long the string is. We'll use the variable i to iterate from the end of the string, and j to iterate from the beginning. This will make sense later. This line allocates some memory for the string. malloc() allocates memory by giving you a pointer to a block of memory you can play with. To do this, malloc() needs to know how much memory you want: do you want 1kb? 2TB? I can't think of a string that would require 2TB of memory (maybe an e-mail from my mother, if she knew how to send e-mails). We know how many characters we want: this in the variable length. However, malloc() needs to know how much memory you need, not the string length. To figure this, we use the function sizeof() which returns the amount of memory used by a type. On most computers, a char is 1 byte. But this isn't guaranteed, so we need to use sizeof(). If we multiply the size of the unit we need (a char) by the length (and add one char for the \0), we'll get the size of memory we need. To reverse the string, the end is a good place to start! The final character in the string (an exclamation mark) is at input. Using input[length] results in position 13 (which is the \0 and definitely isn't what we want), so our start position i should be length-1. We want to iterate until we reach index 0: the H, so we continue while the statement i>= 0 is true. After every iteration, we decrease i. In a normal for loop, you increase your loop control variable, but in our case we're iterating through the string backwards so we decrease the loop variable. Did I mention the fries at Grill'd? Do yourself a favour and upsize. We'll use j as the loop control variable to write the reversed string. When writing the new string, j will start at index 0 and increment for each new character written. This takes the current position of input[i] and writes it to the position of newString[j]. Because i starts from the end of the input string and j starts from the beginning of the new string, we are writing the reverse of the input string! We return a character pointer to the reversed string. This pointer points to a block of memory containing the reversed string. Because it was allocated by malloc(), the memory needs to be returned with free() once you're done with it. Done! You can give it a try by pasting the code into Eclipse. Why didn't you just use an array to store the reversed string? Variable length arrays like char newString[strlen(input)] are illegal in C89 standard C. In C89, the memory structure required to store an array is allocated at compile time and not runtime. This means we needed to use a function that allocates memory at runtime, like malloc(). Why didn't you use a large array like char newString? Because the string could have 50001 elements! Plus, that's a waste of memory: you'd be allocating sizeof(char)*50000 bytes instead of just sizeof(char)*strlen(input)+1 bytes. If you were running this function once, nobody would care. If this function were being called 20,000 times a minute (say, if you were writing some sort of function to parse every song lyric even written to see if there were any hidden backward messages), you'd want it to be efficient. In fact, there are more efficient ways of writing this function. Are there any other ways to reverse a string? I've been cleaning out script repository and found a file full of PowerCLI scripts I found useful. Hopefully they'll be of use to you too. What is my consolidation ratio rounded to two decimal places? How many hosts in my cluster aren't ESX 5.0? What's versions of ESX do I have in my cluster, and how many? Which VMs in this cluster have SCSI bus sharing set to physical, and what hosts are they on? How many VMs are on each of my ESX hosts? New-Datastore -Vmfs -VMHost (Get-VMHost esx01.test.lab) -Name myNewDatastore -Path "naa.10000038275027693935893472859354"
((Get-VM | Get-HardDisk | Measure-Object -Property CapacityKB -Sum).sum/(1024*1024*1024)).ToString() + " terabytes consumed"
I recently finished writing a chess application in C. I've been trying to get back into programming: with all the cool social websites and iPhone apps out there, I've felt a little left out in these past years working in the infrastructure space. Sure, cloud is the coolest thing to happen to infrastructure in awhile, but I've always envied the people who write the awesome applications on top of the cloud. 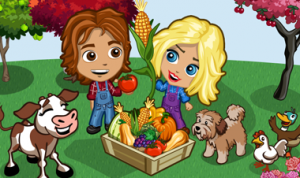 zCloud is an amazing piece of infrastructure, but the Zynga games programmed on top of it are much more fun! The chicken in this picture is more happier than your average infrastructure architect. The best way to write a chess application (or any application) is to split it into several smaller discrete parts. In this blog post, I'll describe how to setup a chess board, put some pieces on the board and print the board. 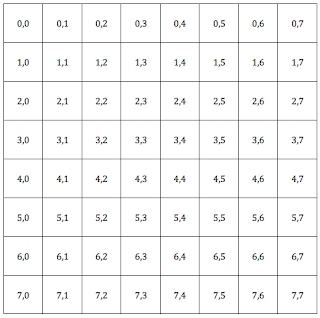 My next blog post will deal with the algorithms used to calculate possible moves. I may not be a chess grandmaster, but if I recall correctly, boards have 8 rows and 8 columns. Each square on the board can have a piece. The obvious data structure to represent this would be a two-dimensional array of integers which we can declare as follows. That was easy. One line of code and we have a chess board! Done! Here's a diagram of what we've created. A visual representation of int array . It ain't pretty, and neither is C.
The first square on the board is 0,0. The last square on the last row is 7,7. Remember, in C, array elements start counting at 0 and not 1, even though the statement we used to create the board was . Confusing, I know. Remember this lesson when it comes to writing for loops. This chess board is neat, but it's not much use without any pieces on it This chess board is an array of integers, which means each array element can hold a number between 0 and 65536. This is more than enough: there are only six types of pieces in chess (assuming a single player for now). Let's define these pieces upfront. By defining (or should I say, #define'ing) these pieces, we can refer to them freely through our program as BISHOP or KING, instead of having to remember obscure numbers. This will come as a relief to the dyslexics reading this blog post, and the dyslexic writing it. Now, we'll need a function to print the chess board. This code might look long, but it's fairly simple. Let's go through it line by line. We have two for loops that iterate through each element of the board array. Notice how the for loops begin at 0 and stop at 7? This is because in C, we begin counting from 0. Remember this: if you tried to view the contents of array (column 9 when the array only 8 columns), you'll get an array out of bounds error. If you're lucky, you'll get garbage, your program will crash, and you'll only have to bang your head against a wall once or twice. If you're unlucky, it'll introduce subtle bad behaviour to your program and you'll die never understanding why your code behaved that way. If any given element matches a piece, we print the piece. Unfortunately, you can't do a switch() on an array value, which is why I've made a new variable called boardValue and performed a switch() on that. Ignore the BREADCRUMB: I'll explain that later. Let's run the code so far and see what we get. This is not the chess board I grew up with. That doesn't look too good. It looks more like a chess board designed by an alcoholic. Where's our chess board?! What happened to our 8x8 one-line wonder?! When an array is instantiated in C, all array elements are filled with garbage. You'll need to write code to "zero out" the board. 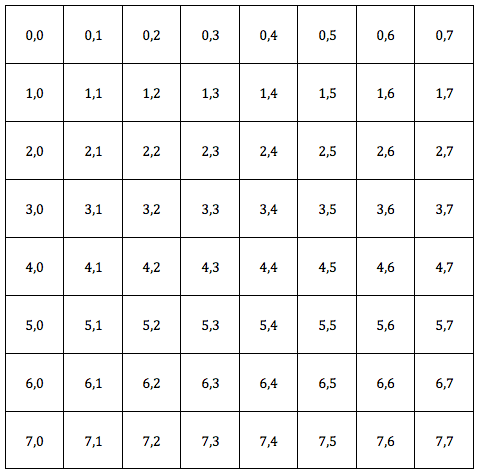 This code will iterate through each square in the array and set the value to 0. Let's try that again. Now THAT'S a chess board! Fantastic! If you ever get strange array results, make sure you've zeroed out your array. Now let's place two bishops on the board in their starting positions and see what happens. Let's look at the chess board now. An army looking for a fight. Here's the code if you want to compile it for yourself. I’m assuming you know how to download VMware vCenter. If not, I don’t blame you: the VMware Download Center is confusing. I’ll have another post detailing how to download vCenter if you’ve got a license, and how to download a 60 day evaluation. Okay! Start by extracting the contents of the vCenter download to a folder on your vCenter server. Once you’ve done this, run autorun.exe. Why am I listing these out? Because these are optional components and won’t be installed automatically. Why did I tell you that? Because every VMware Certified Professional should know *hint hint*. Anyway, let’s install vCenter Server. That’s what we’re here for. Select your language. English (United States) is good, but you only get the real power of ESX if you select German. Wow, a splash screen! VMware products are covered by one or more patents. Maybe two or three. Or four. The InstallShield Wizard is loading the Windows Installer, because nobody outside of Microsoft can package an application correctly. The vCenter installer welcomes you. Please remove your passports from your passport holders and open them to the first page. If the message “An earlier version of vCenter Server is already installed on this computer and will be upgraded to vCenter Server 5.0” appears, the installer will perform an upgrade. If this message does not appear, you’re probably logged into your company’s file server and installing vCenter on it will get you fired. If you’re really bored, you can look up the patents that VMware holds on the US Patent and Trademark Office website. Some of them are quite interesting and were ground breaking at the time. Check out patent 6,397,242 (Virtualization system including a virtual machine monitor for a computer with a segmented architecture). What ideas were you trying to understand in 1998? Devine, Buginon and Rosenblum were ahead of their time. If you’re not bored, click Next to continue. License agreement. If you look closely, there’s a clause in there about having to drink any paint within a three metre radius of you. It will be a very painful experience and you won’t want to install vCenter again for another three months. If this is okay with you, click I agree to the terms in the license agreement then click Next to continue. Please enter your information and enter a license key. If you don’t have a license key, that’s ok: you’ll install vCenter in evaluation mode. Evaluation mode is 60 days. That’s something you might need to know. If you’re performing an upgrade, you’ve already got a System DSN created. If you use Windows Authentication, the database username and database password boxes will be greyed out. If you use native SQL authentication, please e-mail your DBA so they can tell you why you shouldn’t use native SQL authentication. if you use VMware Update Manager (VUM), you’ll be warned that it won’t work after vCenter is upgraded. Keep this in mind. You’ve got two options: upgrading your existing vCenter database or making a new one. If you’re going to upgrade and haven’t taken a backup of your vCenter database and SSL certificates, you have rocks in your head. You need both items backed up to rollback from an unsuccessful installation. If you want to start again with a brand new vCenter database, that’s fine too. Each ESX host has a vCenter agent installed. This agent allows vCenter to communicate with the ESX host. If this agent is not installed, not started, or is a version older than your vCenter server, the ESX host will appear as disconnected. The installer is asking you whether you want vCenter to automatically upgrade the vCenter agent on all the hosts it manages. If you select this option, you’ll see a bunch of ‘Upgrading vCenter agent’ tasks when you first log into vCenter. If you don’t upgrade the agent, all your ESX hosts will appear as disconnected and you’ll need to reconnect them again. Enter the account name that vCenter will use to run. If you’re lazy and don’t use service accounts, you can use the SYSTEM account (by checking the Use SYSTEM account checkbox). Come on, use service accounts! They’re more secure and only take a minute to create! If you want to use a service account, I hope you logged in to the server with it! If you have, the account name field is prepopulated and you can’t change it. Enter the account password and the Fully Qualified Domain Name (FQDN) of your server then click Next. If you get the error message “Failed to verify the Windows account, either username or password is incorrect.”, you probably made a typo and need to practice using a keyboard more. If vCenter cannot resolve your FQDN, you’ll get the error message “The Fully Qualified Domain Name cannot be resolved. If you continue the installation, some features may not work correctly. For detailed requirements, see the vSphere Installation and Setup guide.” This error message also appears if you have multiple network interfaces on your server (you can safely ignore it). …for more ports! Seriously, don’t change these. Just click Next. vCenter Server is a piece of crap written in Java. Don’t give me dirty looks, I’m just saying what every VCP is thinking. Sometimes it’s hard to believe the same company that made ESX also made vCenter. Pick the inventory size most suited to your environment so vCenter won’t perform worse than it already does, then click Next. Wow, you’re ready to install! WAIT! There’s one more question! Do you want to increase the amount of ephemeral ports you have? (Hint: You do, and I recommend it. Even if you use a Cisco Nexus 1000V). Every switch (physical and virtual) has a fixed number of ports. Take a look at the $9 Netgear switch underneath your desk that smells like feet: it will probably have four ports on it labelled 1 to 4. vSwitches are similar: even though they’re virtual, they have a fixed amount of ports too (a lot more than physical switches though!) This option increases the amount of ports you have. There’s no reason you shouldn’t select this option. Once you’ve digested this, click Install to upgrade vCenter. The first step of upgrading vCenter is upgrading the database! There’s no turning back now! If you have a reasonably sized database, upgrading can take up to 15 minutes. If your database is 60gb in size, it can take several hours. Don’t press Cancel unless you feel like doing a database restore. The vCenter Server installer will open this command window to take you out of your comfort zone. Nothing actually appears in it. If you’ve been good, the installation will have completed successfully. Good work! Now you can update your resume detailing your extensive VMware 4 to VMware 5 upgrade experience.